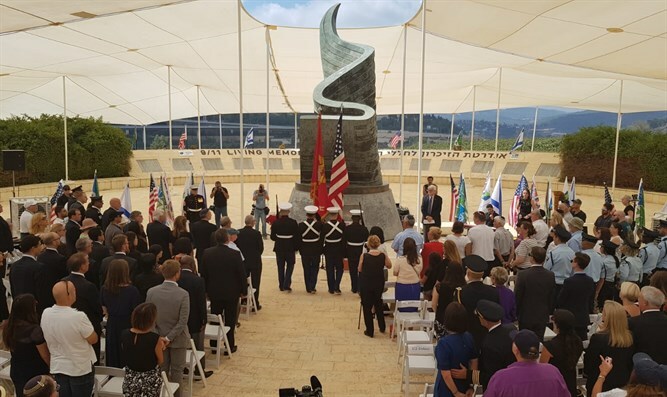 "Welcome to all of you – fellow Americans, Israeli friends, families of the 9/11 victims and victims of other acts of terror, members of the diplomatic corps, among them representatives of countries who lost citizens on 9/11, Member of Knesset Nachman Shai, Mr. Ed Blank, honored guests. Let me offer a special thanks to our friends and cosponsors from Keren Kayemet Le’Yisrael-Jewish National Fund and Jewish National Fund USA. And let me also say how honored we are to be joined by Nefesh b’Nefesh, Sar-El, the Alexander Muss High School in Israel, and by United Airlines representatives. We are gathered to remember and to honor the memory of those lost on this day 17 years ago. Today we remember a day that began like so many others, with rides to school and commutes to work, early flights for meetings and familiar routines with those quick hugs and goodbyes. It was a normal day like this one – with a clear blue sky. But it quickly became an infamous day, one that would be filled with clouds of smoke and a day when a nation, and much of the world, would be shaken to its core. A day when nearly 3,000 lives were snatched from the families who loved them. Today, 17 years later, we can each remember exactly where we were when we witnessed those horrific scenes. We cannot forget the day we saw the world we thought we knew crumbling before us. Never before had we felt so vulnerable and so angry. Never before had a foreign enemy attacked us so brutally and so close to home. Our friends in Israel unfortunately knew exactly how we felt, haven fallen victim to countless terrorist attacks of equal barbarism. While some in this region – enemies of both Israel and the United States – chose to celebrate, the people of Israel cried with us, mourned with us, and sought to comfort us from a pain they knew only too well. To the bereaved families with us today – from this and other terror attacks – we cannot begin to imagine the pain you've endured these many years. We will never fully understand how difficult it has been for you to carry on, to summon the strength to rebuild your lives. In this beautiful plaza, at this inspiring location, we remind the families of those lost and we confirm to people everywhere, that we stand together – Americans and Israelis – and that together we continue to heal and to build, in a spirit of solidarity and commitment to the future. This year, we gather in the most meaningful and poignant period in the Jewish calendar. We meet today a few days before Rosh Hashana. The Torah teaches that we are created in the “image of G-d” “Betzelem elokim,” confirming the uniqueness of every single human being. Each life lost represents a precious and unique individual, who has no replacement or substitute. Rosh Hashana is also known as Yom Hazikaron – Day of Remembrance, and one of the main sections of the prayer service is zichronot - remembrances – a time to remember our personal histories and our actions during the past year. Why is remembering so important? Why are we here again, 17 years later, in remembrance of those nearly 3,000 people who were killed on that tragic day? Sometimes people will say to us when we are grieving, “You must not keep thinking about the past. It’s not healthy. The past is gone. You have got to focus on the future.” As well-meaning as this advice might be, the advice is misguided. For remembrance — recalling events, conversations, occurrences from the past — is one of the important ways that we mourn. Memory is basic to human life. History is an exercise in remembering – not forgetting – and the events of 9/11 are now and will always be part of our collective memory. And, simply put, we remember to maintain our vigilance that atrocities of the past will never recur. Remembering the past is critical as we think of the future, a future without terror and a future of peace and reconciliation, a future where all our children and grandchildren can live side by side in peace, security and cooperation. We at the American Embassy in Jerusalem are committed to achieving peace and reconciliation, and we work tirelessly to open communication channels between Israelis and Palestinians, Israeli Jews and Arabs and others minority communities in Israel, and open communication channels throughout the region—helping us all to better realize and focus on our shared goals and values, rather than our differences. No country can take democracy for granted and the challenges to both of our country’s democracies never cease. We each have the responsibility to do everything possible to protect and sustain our democracies from threats to their survival, including threats from terrorism. As we stand together today and share in the tragedy of September 11, 2001, Israel and the United States also share a deep friendship, a rock-solid security alliance, strong economic bonds, and a shared spirit of innovation. All of these are based on a foundation of shared values including ensuring security and peace for our peoples; and to do what we can to help the citizens of all countries live freer, more prosperous, and more democratic lives. Recognizing Jerusalem as the capital of the State of Israel by moving its Embassy here is emblematic of the strong and unbreakable bilateral relationship between the United States and Israel. It’s an opportunity to reaffirm our deep and enduring ties as well as convey the recognition that we share a common commitment to historical truth. How fitting it is that the only September 11th Memorial in the world that lists by name all those who lost their lives in this attack, is located here in Jerusalem. I would like to wish everyone here Shana Tova Tikatevu v'taihatemu, May you be inscribed and sealed for a healthy, prosperous and successful new year in a world at peace.